If you are like most people, just the thought of going on a diet can inspire feelings of hunger (and quite a bit of dread). Your growling stomach and the constant battle within your head fighting off sugar cravings can make dieting nearly impossible. It can feel like you are being deprived of food and you could crack at any minute and indulge, only to feel guilty right after. Fortunately, there are a few ways you can reduce your hunger so that you can get back to a healthier and happier you without feeling deprived. Sometimes when we think we’re hungry, our body is really just thirsty. This is because our hypothalamus regulates hunger and thirst and gives very similar signals when we need to eat or drink. Usually, it’s the latter. To combat this, ensure that you stay hydrated throughout the day and if you feel hunger creeping up, drink about 16 ounces (2 cups) of water and wait 15 minutes for your body to process it before going straight to a meal. There is a clear link between your sense of smell and your appetite. Think back to the last time you had a stuffy nose. You probably weren't as hungry because your sense of smell, which contributes to hunger, was blocked. Sniffing peppermint oil can help reduce your appetite and make you feel less hungry. This has been an assertion by aromatherapists for a long time but several years ago, psychologist Bryan Raudenbush conducted a study which confirmed that the scent of peppermint was indeed effective at curbing hunger cravings. In the study, a set of volunteers were divided into two groups. One group was instructed to inhale the aroma of peppermint (through inhalers) every two hours while the other group sniffed nothing. Over the next week, those who sniffed the peppermint had fewer hunger cravings and actually consumed 2800 fewer calories in the period. For reference, 3500 calories is generally considered to be equivalent to about one pound. Aromatherapy can also help you relax if you tend to be an emotional or stress eater. Some of the best oils for stress include lavender, bergamot and Roman chamomile. Hungry people don’t make good decisions. If your cravings start to bug you in the late morning or early afternoon, and you know dinner time isn’t for several hours, you may be tempted to just have yourself a large lunch so you can focus on the rest of your day and be productive. A meal replacement shake can help you to honor your diet and stay on track with your weight loss efforts. You can always make your own meal replacement shakes using ingredients in your pantry and take them to work with you, or go with a premade powder mix. What’s important is that your shake has lots of protein and fiber, the two most import substances for satiety. The powders are carefully designed and already have calorie limits (usually under 300 calories) but you should ensure that when making your own, you pay attention to how many calories you’re using. Often times you may think you are hungry out of boredom. We are all guilty of eating because we are bored! The next time you are tempted to over-indulge, try getting up and moving your body! Not only will it get you closer to your weight loss goal, but you may not feel hungry anymore after your workout. This is because working out reduces your ghrelin levels that cause hunger and increases the hormones that reduce appetite. Gum chewing is one of the easiest ways to trick your body into thinking that it’s either full or doesn’t require as much food. Though the exact mechanism behind it isn’t fully understood, studies have confirmed that it isn’t just a placebo effect (1) (2) (3). Ensure that you chew sugarfree gum, of course. Fiber and protein are the two most important substances when it comes to satiety. Protein works mainly by altering the levels of various related hormones such as ghrelin and GLP-1 while fiber adds bulk to food and slows down the time it takes to empty the stomach. Another advantage of an increased protein intake while dieting is that it improves muscle retention (we usually lose a combination of fat and muscle while shedding pounds). 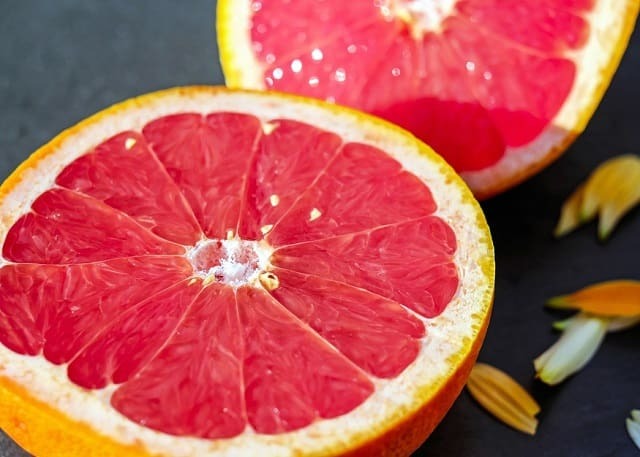 Grapefruit is good for you and it makes for a tasty and colorful breakfast. It has plenty of essential nutrients that are great for you inside and out. Grapefruit lowers your insulin which regulates your metabolism, aiding appetite suppression. Avoid the temptation to smother it in sugar or you will get the opposite effect. Caffeine not only reduces your appetite, it also boosts metabolism so you burn even more body fat. Just make sure you're drinking black coffee or green tea so you're not cancelling out the benefits with high calorie creamers and sugar. It's easy for your hunger to get the best of you during a diet. Practice these healthy and natural appetite suppressant suggestions to help you get the results you're looking for and making it less of a struggle. Happy dieting! I hope you enjoyed this article about how to control your hunger while dieting and remaining on a frugal budget. Interested in more articles about frugal dieting and nutrition?